You wondered how UB would respond after their first loss of the season last week in Army. The Bulls had never won in Mt. Pleasant. So the season of firsts continue as the Bulls improve to 5-1 on the season. The Bulls did it with two freshman running backs both going over 100 yards. Kevin Marks ran for 167 yards and Jaret Patterson ran for 121. Both had impressive TD runs as well. Marks ran from 70 yards out to give the Bulls a 24-10 lead. Patterson stiffed arm his way into the endzone to give the Bulls a 31-17 lead. Tyree Jackson had two touchdowns. He threw a TD pass to Tyler Mabry and he used his legs to score from 5 yards out. Without Anthony Johnson, who was still ailing from a hamstring injury, the Bulls relied more on the running game. 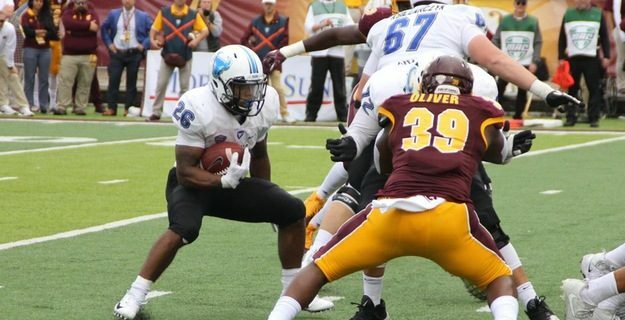 UB ran for 307 yards on the ground against the MAC’s best defense. Tyree’s numbers were 10 of 20 for 127 yards. The Bulls defense intercepted CMU QB Tommy Lazzaro four times. Three straight possessions in the fourth quarter ended in Bulls interceptions. That sealed the win. The Bulls are 2-0 in MAC play, as they return home on Saturday to face Akron for a noon kick-off at UB stadium. Texas has now won five straight games. Their longest win streak since 2013. The Longhorns deserved this win. Sam Ehlinger threw for 314 yards and ran for another 72. Texas was up by 21 points entering the fourth quarter. Kyler Murray led a furious fourth quarter comeback for the Sooners. Oklahoma tied the score at 45 with 2:38 to play. Texas responded with a field goal drive to win it. Cameron Dicker hit a 40-yard field goal with 9 seconds left to lift the Longhorns to victory. Texas is now the front-runner in the Big 12. The Longhorns haven’t won the Big 12 since 2009. After an early season home loss to Kentucky you might of thought it would take a year or so for Dan Mullen to turn things around for Florida. This was an impressive win. LSU went up 19-14 with 11:14 to play. Florida then responded with a touchdown drive aided by a trick play. Seldom used TE Lucas Krull threw a perfect pass to Feleipe Franks to set-up the Gators go ahead score. Gators improve to 5-1 and set-up a showdown later in the year with Georgia to decide the SEC East. Notre Dame looks poised to be in the final four after winning their toughest game remaining on the schedule. The Irish only led 17-16 at the half, but used an impressive 28-7 second half run to win their first game ever in Lane Stadium. This was the first game Irish QB Ian Book struggled. He still threw for 271 yards and two TD’s but was less impressive than his first two starts. The two toughest games remaining on the Irish schedule are late November contests at home to Syracuse and on the road to USC. *Northwestern upset Michigan State in spite of rushing for only 8 yards on the ground. Clayton Thorson threw for 373 yards in the Wildcats 29-19 win in East Lansing. *What happened to Gus Malzahn’s offense? Fourth straight game Auburn is held under 350 yards of offense as the Tigers fall in Mississippi State 23-9. *Tough year for Florida State continues as they blow a 27-7 second half lead to rival Miami- Florida. The Hurricanes score the last 21 to win 28-27. *Scott Frost and Chip Kelly are still looking for their first wins. UCLA and Nebraska now a combined 0-10 on the season.